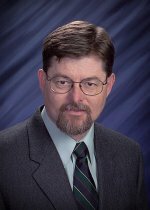 Congratulations to Dr. Jay Grate at Pacific Northwest National Laboratory on being named a Battelle Distinguished Inventor. This award is given to Battelle staff who have 14 or more U.S. patents to their credit as a result of their work at Battelle or Battelle-operated national laboratories. Grate’s patents cover concepts in functional materials for biocatalysis and chemical sensing. For example, the BSP3 polymer. This unique material allows sensors to detect nerve agents and other toxic vapors. Sensors with a BSP3 coating can be used to monitor air quality in subways and buildings, and to protect first responders at terrorist or chemical incidents. Grate received an R&D100 award for this invention in 2004. In addition, Grate has received several patents for his work in microscale column separations. These are relevant to the development of microfluidic bioanalytical separations and sensors for pathogen and botulinum toxin detection. Several of Grate’s patents have been licensed over the years through various mechanisms, working with PNNL’s technology commercialization organization. These have included patents in the areas of bioseparations, sensing polymers, vapor preconcentration, radioanalytical separations, and, most recently, biocatalysis. Throughout his career, Grate has worked with experts from other disciplines. “These patents are the result of the efforts of my research group and collaborators,” said Grate. "Not just me alone."